Executive Director of Leduc's Food Bank, Gert Reynar, holds an armful of the snacks that are now available to hungry kids in about half of the schools in the Black Gold School Division. 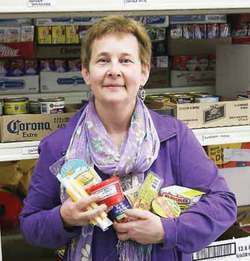 In working with their clients, Executive Director for Leduc Food Bank, Gert Reynar, hears about many different needs within the community, but over the last several years one issue has repeatedly come to the forefront. So much so that the Leduc & District Food Bank has recently expanded their helping hand into some of the schools in the district. "We have started our 'Snack Attack' program based on needs we have found within our community," said Gert. The program is designed to address the increasing need for snacks in school for children who go to school hungry. "We deal with food. It's what we do. We have had parents that, at times, will not send their kids to school because they don't have any food to send with them." Gert shared that the Food Bank had been looking for a way to start a school snack program for several years and has been tucking away a little money here and there as they were able, without taking anything away from the Food Bank itself. 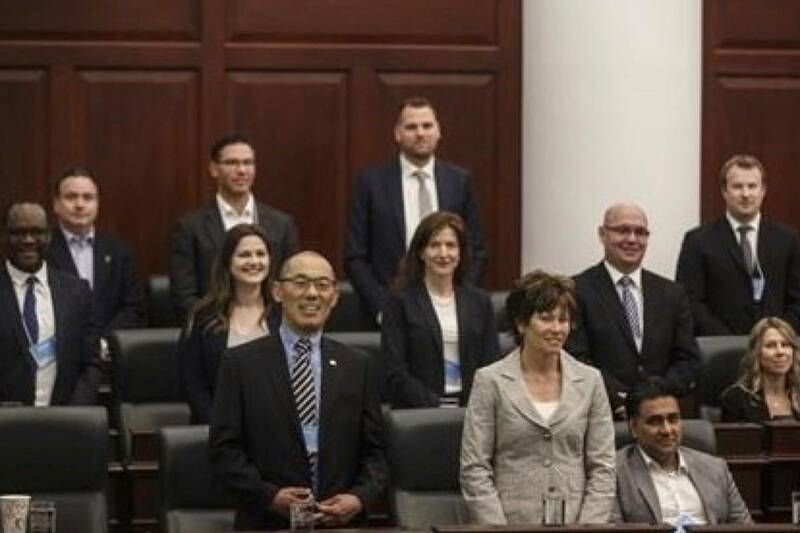 After looking into a similar program being run in Airdrie's 22 schools it was discovered that their program was being run for approximately $15-16,000.00/year. This year there were finally enough funds set aside to run a pilot program in the Black Gold School Division so Gert and all the volunteers at the Leduc Food Bank wasted no time in putting the dream into action. An information sheet and a list of nine snack items approved by Alberta Health Services were sent out to every school in the Black Gold school Division in late October to inform them about the program and to allow the schools (within a preset limit) to order the snacks that they felt would be most appropriate for their school. As the snack items are used up the schools can let the Food Bank know what they need to reorder and those items are delivered to the schools through a network of volunteer drivers. The snack items are tracked to determine the types of snacks most in demand and to ensure that the needs are being met within each school. "The hands-on part of the program is run primarily by teachers," said Gert, "as they are the ones who deal directly with the children and know which kids could benefit from a little extra 'learning fuel'." It has been proven that without proper nutrition children cannot learn properly and eventually these issues can snowball into impediments later in life with a lack of ability to learn and retain information translating into low or failing grades, which limits a young person's educational and employment choices. Currently, approximately half of the schools in the BGSD are participating in Snack Attack and the Food Bank is already getting glowing praise from the schools about the program. "With the great feedback we have received we already know that we will be running this program again next year." stated Gert. "The challenge now will be to find the funding to keep it running. We will be going after government grants as well as opening the doors to private funding from individuals or businesses as we need to make sure the needs of this program are met without drawing from the monies it takes to run our regular program." Another need the Food Bank has at the moment is for volunteer drivers. "We have the vehicles, we just need the people to drive them!" shared Gert. "Most of our pick ups and deliveries are done in the morning hours so if someone has a valid license, a clean drivers abstract and four or five hours free even just one morning a week they could really help us out." Interested persons who would like to assist with either sponsoring the Snack Attack program or by volunteering can call the Leduc & District Food Bank at 780-986-5333.